Nexstim has emerged from its troubled past and is approaching a defining point as we await the results of the E-FIT stroke trial (expected Q318). The outcome will determine the FDA’s response on approving Nexstim’s proprietary rTMS platform for the rehabilitation of stroke patients. Success would further differentiate the device and demonstrate the value of its navigation technology. Whilst not without risks, we believe the current valuation fails to reflect the material progress achieved since the well documented failure of the pivotal NICHE study and subsequent dilutive fund raises. We value Nexstim at €120m, equivalent to €0.97 per share (fully diluted). Accurate navigation means reproducibility Nexstim’s proprietary rTMS technology platform is differentiated by its ability to navigate precisely, reliably, and reproducibly. Its value in pre-surgical brain mapping (NBS) is acknowledged, yet it is its potential in therapeutic applications (NBT) that has most commercial appeal. It has CE Marks for clinical use in stroke, depression, and chronic pain; as well as FDA approval in pre-surgery brain mapping and major depression. However, it is FDA approval for stroke that will transform Nexstim’s outlook. Stroke indication is the key determinant So much rests on the outcome of the E-FIT study. The FDA has been commendably supportive and has indicated that positive outcomes in this 60-patient stroke trial, when coupled with the existing results from the active arm of the NICHE study, would be sufficient to consider approval. Top-line results from E-FIT are expected in Q318. Dilution now quantified, funding required The aftermath of the NICHE trial failure was brutal. The funding required came at a high price and the then shareholders were heavily diluted. The issuance of a large quantity of warrants has created uncertainty and the visibility of the likely dilution has only recently improved. Management has achieved a laudable turnaround and has a clear pathway to market. We estimate €15m is needed to achieve near-term goals. Current valuation reflects the chequered past Understandably, investor confidence has been shaken and the expected dilution from the options and warrants remains an overhang. Yet, given the clear commercial potential, the shares are now undervalued. Employing a risk-adjusted DCF and conservative assumptions, we value Nexstim at €120m. This is equivalent to €1.23 per share currently and €0.97 per share fully diluted. Nexstim was spun out of Helsinki University of Technology to commercialise their proprietary navigational transcranial magnetic stimulation (nTMS) technology in 2000. In 2003 the NBS (Navigated Brain Stimulation) system was developed as a diagnostic tool for pre-surgical brain mapping. In 2014 the NBT (Navigated Brain Therapy) system received its CE Mark for the treatment of stroke and depression, and in 2016 for treating chronic pain. In 2016 the pivotal NICHE Phase III stroke study failed in its primary end-point; which was later shown to be due to the control arm being “active”. The FDA approved the depression indication in 2017, with a supplementary Phase III trial (E-FIT) underway in stroke, and trials planned for chronic pain. An IPO in 2014 successfully raised €15.3m through a listing on both Nasdaq First North Finland and Nasdaq First North Sweden. Plans are in place for commercialisation of the platform, with distribution agreements being finalised. Further funding is required to properly execute these plans, notably the stroke rehabilitation application, and to complete the clinical trial programmes. We value Nexstim using a risk-adjusted DCF-based model for the cash flows for each business area. This yields a valuation of €120m, or €0.97 per share fully diluted. We attribute a value of €13m to the diagnostic application (NBS), with the stroke indication valued at €52m, depression at €44m, and chronic pain at €5m. 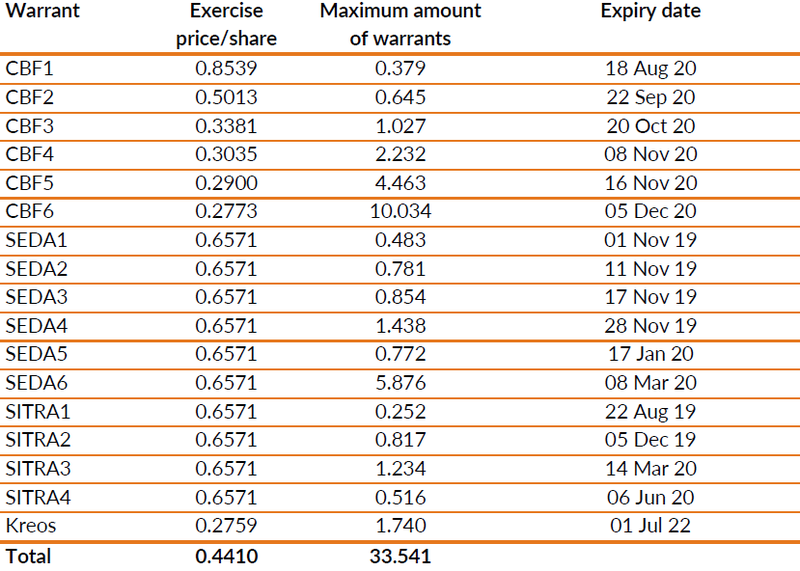 The number of warrants in place adds a degree of uncertainty, with various potential valuation scenarios possible. However, there are several value-inflection points expected over the near- and medium-term, including the FDA approval in stroke, which would result in an uplift to our valuation as the development and execution risks subside. In line with our philosophy, we have employed conservative assumptions throughout. Nexstim’s current financial position reflects the difficulties of the past, with the warrants in place posing a material dilution of the shareholder equity. However, these are now known and well documented. The near-term revenues are driven by sales of the NBS system, but a step change is expected when/if the NBT stroke indication is approved by the FDA. Whilst initial sales are likely to occur in 2019, we are expecting meaningful revenues to accrue from 2020. Our model suggests there is sufficient cash to fund operations to H219, with a funding requirement of around €15m. Our main sensitivities are detailed later however (as with all medical technology products) managing regulatory matters, gaining adequate reimbursement and achieving meaningful market adoption are key factors. Nexstim has dealt with all the regulatory challenges to date, and its applications appear to have compelling clinical and economic arguments suggesting pricing should not be an issue. Nonetheless, these are competitive markets where sustained investment in development and marketing is necessary. The major near-term sensitivity is the successful execution of the commercial strategy, particularly in the key US market. Nexstim is approaching a key value inflection point. The efficacy of its navigated neuro-stimulation platform has been demonstrated by its FDA approved use in pre-surgery brain mapping and in severe depression; however, it is the results of the E-FIT study in stroke that will define Nexstim’s near-term outlook. A positive outcome (results are expected in Q318) should lead to the FDA approving it for stroke rehabilitation and will further differentiate the proprietary platform from other rTMS players. The shares are still languishing following the highly disappointing failure of the pivotal NICHE trial in 2016 and the subsequent decidedly dilutive funding rounds. Nonetheless, the progress achieved since then means that Nexstim now appears to be materially under-valued. We initiate coverage with a €120m valuation, equivalent to €0.97/share (fully diluted). Nexstim is emerging from a difficult period with a renewed impetus as the building blocks for the therapeutic applications of its proprietary TMS (Transcranial Magnetic Stimulation) platform are beginning to fall into place. Nexstim’s chequered history centres on the well-publicised failure of the pivotal Phase III NICHE stroke trial in February 2016. Although the disappointing results were later found to be due to an ill-designed control arm, which resulted in a higher than expected positive result in the control group, the damage was done, and the share price collapsed. The subsequent fund raises were undertaken at levels that were unfavourable to the then shareholders, and the dilution still expected to occur from the outstanding options and warrants remains an overhang. Commendably, management persevered, the cash burn rate was slashed, and a turnaround was achieved. The focus in now on delivering the FDA regulatory approval for stroke and creating an effective distribution infrastructure. The next key event is the read-out of the E-FIT study, which is expected in Q318. The FDA appears to be supportive, for instance allowing the pooling of data with the active arm of the NICHE trial. A positive outcome with E-FIT should lead to approval of the de novo 510(k) application, which would be transformative for Nexstim’s outlook. Realising the commercial value of the technology will require investment in marketing infrastructure and, importantly, the generation of compelling clinical data. High quality outcomes from robust multi-centre trials will not only help ensure attractive reimbursements but raise market awareness and drive clinical uptake. The funding requirement is clear although the amount is uncertain; we estimate that around €15m is needed to deliver the near-term targets. Valuing an innovative technology platform is rarely straightforward, even when it does have approved products and recurring revenues. Inevitably a number of important assumptions have to be made; yet, even when adopting conservative forecasts throughout, our risk-adjusted DCF model suggests that Nexstim is undervalued. In part this can be explained by the previous disappointments and the overhang of the numerous warrants. Nonetheless, the news flow expected over the next 12-24 months should lead to a material re-rating. The unexpected set-back of the pivotal clinical trial failure in 2016 resulted in a material disruption of the business, with programmes cut back and resources directed to the essentials required for survival. Despite this, there has been commendable progress on the core clinical programmes. The nTMS technology platform is proven and its value in pre-operative diagnostic mapping of the brain is acknowledged. However, the substantially larger commercial opportunity lies with therapeutic indications. The three current programmes address stroke rehabilitation, major depression, and recalcitrant pain. CE Marks have been granted for all three, yet it is FDA approval that provides not just access to the US market but essential validation. The FDA approved the depression indication in November 2017, effectively providing a pathway for the stroke indication. What is nTMS and how does it work? Transcranial Magnetic Stimulation (TMS) can be employed for the non-invasive imaging of the brain. Short, high amplitude, magnetic pulses are delivered to the patient’s brain, with the strength, location, and direction of the stimulating magnetic field closely monitored. The locations of the pulses are registered to a magnetic resonance image (MRI) of the patient’s brain. Surface electromyography (EMG) electrodes are attached to various limb muscles. The magnetic stimulation is directed to various parts of the brain to cause a response in the EMG electrodes, indicating the part of the cortex involved in that particular muscle movement. For evaluating the language areas, the magnetic stimulation is directed to the regions that disrupt specific speech tasks. A key difference between TMS and other available non-invasive functional brain imaging techniques is that when the cortical stimulation evokes a physiological response it is certain to be causally related to the stimulus (not simply linked to or participating with the stimulus). The resultant TMS imaging has been validated extensively and is shown to be highly accurate and clinically effective in mapping the cortical motor areas. This can be used in diagnostic applications, such as the functional assessment of motor tracts following stroke, or as treatment options, for instance repetitive TMS (rTMS) is used in the treatment of intractable major depression. For clinical applications the TMS must be accurate, reliable, repeatable, and reproducible. This has led to the need for navigated TMS (nTMS), where a variety of methods, such as line-navigation (where the orientation of the coil is used to approximate the positioning of the magnetic field), have been used. However, despite the employment of positioning software to map the three-dimensional alignment, the error with these systems in clinical use is typically circa +/- 10mm and achieving consistently accurate positioning over repeated imaging procedures has been problematic. Nexstim’s approach was to model the brain as over 40,000 individual spheres rather as one simple single sphere. Such multi-sphere modelling allows the shape and composition of the brain to be considered in detail, notably the varying effects of grey matter, white matter, and the cerebrospinal fluid. The multi-sphere approach also accommodates for the physical and physiological differences seen between patients. A proprietary algorithm is employed to accurately calculate the position, orientation, and effect of the field. The software allows for the dynamic recalculation of the field if the operator moves, turns or tilts the coil (even slightly) with the updated location, orientation and field strength shown in real time. Nexstim’s nTMS, known as NBS (Navigated Brain Stimulation system) has been validated through numerous independently reviewed clinical trials. Although direct electrical cortical stimulation (DCS or DES) is the “gold standard” for cortical localisation, as the name implies, it is a highly invasive procedure that is usually reserved for use during surgery. DES and nTMS both work on the principle of a direct cause and effect relationship between the input (either direct electrical stimulation or through the magnetic field) and output (as measured by the muscle EMG amplitude). A number of studies and reviews have compared the results of pre-operative nTMS mapping with the subsequent intra-operative DES mapping, with a good correlation  seen between the two approaches. Nexstim’s nTMS was first developed as a diagnostic tool (NBS) for the pre-surgical mapping of the brain. The recommended first-line treatment for most brain tumours remains rapid and aggressive resection, whilst preserving as much essential brain function as possible. The NBS system can accurately identify the location of the functional, or eloquent, areas of the cortex and so provide a clearer and more detailed delineation of the resectable and non-resectable cortical tissue. The greater understanding of the tumour’s positioning and the border between cancerous tissue and eloquent cortex can lead to more precise, and more radical (allowing previously ineligible cases to be operated on), resections. The NBS system is straightforward to operate and is the only nTMS system that is FDA cleared and CE marked for the pre-surgical mapping of the speech and motor cortices of the brain. There is a growing evidence base that supports its use, with significant improvements seen in progression free survival (46% in low grade gliomas). The positive findings have been consistently replicated across multiple sites and, importantly in our view, operator experience and skill does not result in any meaningful variation in outcomes. The value of nTMS has been increasingly recognised and its integration into the surgical workflow has been notably quicker than many other techniques, with not only more effective pre-operative planning but also better patient counselling and improved surgery procedures. The NBS system consists of all the necessary diagnostic and visualisation equipment and includes the reclining chair where the patient is seated during the operation. Nexstim uses third-party providers for most components (including Sanmina Corporation), with the assembly and final configuration undertaken by the company in Finland. Since its first introduction in 2003 the marketing efforts have primarily been targeted at universities and teaching hospitals with a strong key opinion leader (KOL) presence in the fields of neurosurgery and radiology. Reimbursement codes for pre-surgical mapping using NBS are already in place, for instance in Germany (OPS). By the end of 2017 a total of over 150 NBS systems have been sold, spread across the US and Europe (including Russia). The client list is impressive, with many world-renowned clinics routinely using the tool in pre-surgical mapping. The pricing tends to be around €200k to €300k (depending of the levels of functionality and support equipment), making this a capital purchase for most buyers. This means the sales cycle is longer, with the clinical decision maker (typically a neurosurgeon) preparing a case that is subject to a thorough budgetary review. The number of consumables used in the diagnostic setting is small, being limited to replacement coils and, somewhat more frequently, trackers. Although the use of the NBS system in diagnostic applications is a useful demonstration of the potential of Nexstim’s nTMS platform, its true commercial potential lies in its use as therapy in several currently poorly addressed indications. The platform has been optimised for therapeutic applications and this is known as the Navigated Brain Therapy system (NBT). The simplicity of application, cost-effectiveness, and excellent safety profile has made nTMS an appealing target for therapeutic application for several decades. However, the practical limitations, notably its low precision, high labour intensity, and need for high levels of operator skill and expertise to manipulate effectively, has meant it has never really moved beyond investigational and research use. NBT is different in that it has the inherent properties of being able to accurately localise the target areas, deliver a precise and consistent magnetic pulse, and to reproducibly return to the desired site repeatedly over time. It is these abilities that enable NBT’s use as a meaningful therapeutic tool, especially in the important out-patient setting. As mentioned previously, the indications being developed currently stroke, depression, and chronic pain. Stroke remains a major concern in medical, societal, and economic terms. The sustained emphasis on cost containment has brought the economic aspects to the fore, particularly the longer-term impacts. Most strokes (87%) are ischaemic, being caused by thrombosis or embolism, with the rest (13%) being haemorrhagic, mainly due to blood vessel rupture or aneurysm. Mortality is highest with haemorrhagic stroke, around 37% at 30 days, with the equivalent ischaemic stroke mortality being only 8-12%. The WHO estimates that stroke caused 5.8m deaths globally in 2016, up from 5.2m in 2000, ranking second only to ischaemic heart disease. There were 795,000 strokes in the US and 1.2m in Europe last year, with the incidence in low- and medium-income countries rising. The prevalence of stroke events is expected to increase as the population aged over 65 grows. The stroke management market is large and growing (forecast by Research and Markets at $36.7bn globally by 2023, a CAGR of 7.4%). The acute in-patient costs average $38,000 in the US, with the “lifetime” costs estimated at $60,000 per stroke episode. Whilst such estimates include the costs of diagnosis, treatment and rehabilitation care, they do not capture stroke’s true economic impacts. Despite improvements in care, the consequences of stroke remain a major problem. While 50% to 70% of those who survive an ischaemic stroke will recover functional independence within three months of onset, 20% will require institutional care. The burden of care for the remainder, whose disability precludes independence, falls back into the primary care sector and is mainly borne by the patients and their families. It is against this background that NBT’s potential use in stroke rehabilitation has been so positively embraced. The brain can reconfigure its activity in the aftermath of an ischemic stroke thanks to its natural plasticity. Following a stroke widespread changes occur within the damaged hemisphere, ranging from structural reorganisations (including synapse formations) to increases in both excitatory and inhibitory neurotransmitters. Compensatory mechanisms may result in functional changes not simply in adjacent cortical areas but in the hemisphere contra-lateral to the site of injury. The centres involved in motor and speech control (the eloquent cortices) are inter-connected extensively between the two hemispheres. Normally an inter-hemispheric balance is maintained through an inhibitory mechanism, with each side dampening activity in the other. Intriguingly, following a stroke the injured hemisphere may be seeking to improve its activity whilst the healthy hemisphere is dampening down what it views as abnormal raising. rTMS can be used to either stimulate or inhibit brain cell activity, hence its can be used as 10Hz repetitive pulses to stimulate the damaged site(s) or as lower 1Hz repetitive pulses to inhibit activity on the corresponding healthy side of the brain. Initially the decision to opt for inhibiting the healthy hemisphere was driven by not wishing to disturb the natural healing processes in the lesioned hemisphere; however recent research (admittedly still to be corroborated) suggests healthy hemisphere inhibition may also be more effective. Early clinical studies supported this view but, importantly, demonstrated that accurate navigation was a key determinant of efficacy. It is the reproducibility of hitting the right target area both during and between therapy sessions that drives outcomes. The hypothesis was tested in 2010-13 with a proof-of-concept Phase II study (Contrastim) at the renowned Rehabilitation Institute of Chicago (RIC), led by Dr Richard L Harvey, involving 29 patients with sub-acute stoke. The trial examined motor function improvement, notably hand and arm functionality, in patients three to nine months after a stroke (i.e. beyond the typical window for spontaneous recovery). The patients were randomised into 19 who received NBT therapy (1Hz contra-lesional NBS-guided rTMS) and 10 who received an equivalent sham treatment. Treatment consisted of 20 minutes of pre-functional occupational therapy, 17 minutes of nTMS, followed by 60 minutes of upper limb task-oriented occupational therapy. The treatment involved three visits a week for six weeks, which is the standard of care in the US, with follow up visits at one week, one month, and six months. The primary end-point was change in upper extremity Fugl-Meyer score, a well-accepted indicator of functional improvement in motor skills. Secondary end-points included Action Research Arm Test (ARAT), Stroke Impact Scale (SIS), Chedoke Arm Assessment, and NIH Stroke Scale. The methodologies of each outcome measure are detailed in Exhibit 1. Upper extremity Fugl-Meyer Score measures motor impairment in hemiplegic upper limb of patients with stroke. The scoring follows the natural progression of motor recovery as defined by Twitchell (Brain. 1951; 64:443-480). The score was developed by Axel Fugl-Meyer and has been validated (Scand J Rehab Med. 1975; 7:13-31; Stroke. 2009; 40: 1386-1391). The scale ranges from 0 to 66, with 66 representing normal motor function and 0 representing no movement. There are 33 movement items each scored 0 (cannot perform), 1 (performs partially), 2 (performs flawlessly). The ARAT (Action Research Arm Test) is a measure of upper limb dexterity and is a 19 item measure divided into 4 sub-tests (grasp, grip, pinch, and gross arm movement). Performance on each item is rated on a 4-point ordinal scale ranging from: 3: Performs test normally; 2: Completes test but takes abnormally long or has great difficulty; 1: Performs test partially; 0: Can perform no part of test. Range is 0-57 with higher scores relating to better upper limb dexterity. The SIS (Stroke Impact Scale) is a quality of life questionnaire designed for stroke survivors. It is a 59 item measure with 8 domains assessed: Strength (4 items); Hand function (5 items); ADL/IADL (10 items); Mobility (9 items); Communication (7 items); Emotion (9 items); Memory and thinking (7 items); Participation/Role function (8 items). Each item is rated in a 5-point Likert scale in terms of the difficulty the patient has experienced in completing each item. Summative scores are generated for each domain, ranging from 0-100. Chedoke Arm Assessment is a 7 point scale of motor recovery scored separately for arm. 7 is good motor recovery and 1 is no movement. NIH Stroke Scale is a composite scale derived from the Toronto Stroke Scale, the Oxbury Initial Severity Scale, the Cincinnati Stroke Scale and the Edinburgh-2 Coma Scale. 15 items assessing severity of impairment in LOC, ability to respond to questions and obey simple commands, papillary response, deviation of gaze, extent of hemianopsia, facial palsy, resistance to gravity in the weaker limb, plantar reflexes, limb ataxia, sensory loss, visual neglect, dysarthria and aphasia severity. Items are graded on a 3 or 4 point ordinal scale; 0 equates no impairment. Scores range from 0 – 42. Higher scores indicate greater severity. Stroke severity may be stratified on the basis of NIHSS scores as follows (Brott et al, 1989): Very Severe: >25; Severe: 15 – 24; Mild to Moderately Severe: 5 – 14; Mild: 1 – 5. The results are tabulated for both primary and secondary outcomes in Exhibit 2. An abstract was presented at the International Stroke Conference 2014. The group receiving NBT treatment showed clinically important improvement (over 4.5 points on the primary Fugl-Meyer scale end-point) compared to the sham group, with 88% exceeding the published minimal clinical important difference (MCID) at 6 months compared to 38% in the sham group (p=0.002). The study also noted that the improvements in motor function with NBT treatment were material and lasting. In summary, this proof-of-concept Phase II study showed that NBT produced a statistically significant improvement in hand and arm functionality and that the effects were lasting. It also confirmed, as expected, that the safety profile was benign and that the reproducibility of treatment was high. On the back of these robust results a pivotal two-year 12-centre Phase III study was initiated in May 2014, also led by Dr Harvey. The purpose and structure of this much larger trial was based extensively on the successful Phase II study and was expected to support an FDA approval. The results of the NICHE pivotal Phase III study were announced in February 2016 and its failure was surprising. The Data Safety Monitoring Board (DSMB) had performed its second planned review of the interim data and noted that there was no difference between the active and control arms of the patients. No safety issues were seen and both enrolment and treatments had been completed as scheduled, but the study was unlikely to meet either its primary or secondary end-points. As in the Phase II trial, the objective of NICHE was to demonstrate a clinically important functional difference (at least five-point improvement on the upper extremity Fugl-Meyer score) from baseline to six months post-treatment between the active NBT and sham patient groups. It was clear that the sham (or control) treatment group had responded better than would be expected based on the earlier Contrastim study (which showed 13.8 points in the active vs 7.1 points in the sham group) and historical experience with standard of care therapy. The treatment group had seen 67% of subjects (n=132) achieve a minimum of a five-point gain in Fugl-Meyer score, whilst the sham group (n=67) saw 65% of its subjects achieve a corresponding improvement (p=0.77). The average improvement, across both arms, was 8.2 points. A similar pattern of equivalence was in seen the secondary outcome measures such as ARAT and WMFT scores (Exhibit 3). For context, a 5.0 point improvement in Fugl-Myer can mean the difference between being able to lift a small object and being able to do and undo a button. Examination of possible causes showed that the NICHE sham arm used a different “dummy” treatment to that employed in the Contrastim study. In the NICHE study the coil appeared the same and delivered a similar, but non-focussed, cortical impulse. To maximise proper blinding of the operators as well as the patients, the sham treatment had used an altered magnetic field pattern that generated a similar scalp tingling effect for the patient, and visible skin puckering for the system operator, to that seen with the active treatment field. Essentially the sham field was more diffuse and focussed to form a ring (torus) field around the target area, rather than a sharp cone shaped field as in the active treatment (Exhibit 4). It is now thought that the electric field delivered by the sham coil used in the NICHE trial may have induced neural activation in the motor and pre-motor cortex. The active coil was focussed sharply to deliver targeted stimulation to a defined area of the motor cortex. The sham coil delivered stimulation over an area 20-40 times larger than the active coil and avoided the target of interest by creating a “hole” in its doughnut shaped field. The result is the sham coil delivered about 30% of the E-Field intensity (10-30 V/m) to the target area compared to the active coil. Subsequent research has shown that E-Fields as low as 5 V/m can induce spike firing in the pyramidal cortex. Following discussions with the FDA a supplementary Phase III, known as E-FIT, was initiated. This is also a randomised, double-blind, sham controlled trial but involves only 60 patients recruited in 5 US centres. The sham device has a similar outward appearance to the active coil, but the magnetic field produced is substantially lower and “flatter” in shape (essentially replicating the sham field in the Contrastim study). The FDA appears to have been very supportive, possibly linked to the lack of any safety concerns to date, and will allow the pooling of the active arm patients from the NICHE and E-FIT trials together for a common analysis. The NICHE study had 2:1 active arm/control arm randomisation ratio and E-FIT had a 1:1 ratio, which suggests around a total of 165 active patients eligible for analysis. Management is comfortable that this has sufficient statistical power. The results of this key study are expected in Q318 and, if positive, the clinical data will form the basis of a de novo 510(k) submission to the FDA. The FDA cleared the NBT platform for use in depression in December 2017, so a regulatory pathway has been established. However, the depression indication employed a simplified 510(k) procedure as an approved predicate rTMS device existed. With a de novo submission the FDA tends to adopt a more cautious stance as this will form the basis for future predicate device submissions by other manufacturers. Clearly a successful outcome from the E-FIT study, with subsequent FDA clearance, would be transformative for Nexstim’s outlook but a de novo 510(k) approval does not guarantee reimbursement not does it grant commercial success. The evidence required to gain regulatory approval, no matter how compelling, is seldom sufficient to gain rapid, and sustained, clinical uptake. The importance of and requirement for clinical evidence is not as extensive as in pharma/biotech; however, it is becoming an increasingly prominent contributor to the successful marketing and reimbursement of medtech devices. This is especially relevant as both clinicians and payors increasingly demand convincing health economic data to support any premium pricing for innovative products and, more importantly, to allow its widespread use across multiple clinical settings. The dynamics of the stroke market vary markedly by geography, essentially reflecting the varying treatment protocols. A common emerging theme is that post-acute care and rehabilitation are often considered a costly area of care to be trimmed but without recognising their clinical impact and ability to reduce the overall medical and economic burden. Various bodies argue the provision of comprehensive rehabilitation programs with adequate resources and duration is an essential aspect of stroke care and should be a priority in any redesign efforts. A long-term care facility that provides therapy and skilled nursing care. In Europe, most stroke patients receive lengthy (up to 60 days) hospital-based monitoring to minimise the risk of stroke recurrence and to provide rehabilitation therapies. In the US the typical procedure is a short period of acute care in hospital, usually a three-day stay, followed by a move to Skilled Nursing Facilities (SNF) for care and rehabilitation as required. Medicare covers about two-thirds of stroke patients (due to age), with the rest having other insurance cover. Stroke is usually reimbursed via a case payment system such as DRG (diagnosis related group). This is essentially a reimbursement system whereby a hospital receives a fixed bundled payment (based on average treatment cost) per patient to cover all costs associated with diagnosis and treatment, rather than separate sums for each product or procedure used. Exhibit 5 provides an overview of the inputs into a typical DRG. The US and many European countries have DRG systems, albeit with subtle differences, especially in relation to their treatment of higher priced procedures or products such as NBT. We believe Nexstim would need to invest in studies to generate high-quality data to expand the evidence base and demonstrate NBT’s clinical and health economic benefits to all stakeholders (clinicians, patients and payors). The data from these post-marketing trials would be used to leverage NBT’s superior performance vs standard of care to drive increased awareness and usage by Key Opinion Leaders (KOLs) and larger specialist centres. This would, in turn, have trickle down effects by driving increased adoption in the smaller units. Clearly the commercial opportunity for NBT in stroke rehabilitation is sizeable. However, any real assessment of NBT’s likely rate of adoption and penetration into this market is premature until the results of the E-FIT study are known. In our modelling (see later) we have adopted conservative assumptions throughout and risk-adjusted where relevant. Yet despite such caution, we conclude the current value of Nexstim fails to reflect the potential of NBT in stroke alone. The use of rTMS in the treatment of depression is well documented and is viewed as a means of delivering brain stimulation with neither the seizures or risks associated with electroconvulsive therapy (ECT), nor the potential side effects and risks of pharmacological augmentation strategies, such as monoamine oxidase inhibitor (MAOI) therapy. rTMS has been shown to be effective not simply in the rigorous setting of a clinical trial but in real world situations. Remission rates are 30-40% and the effect duration is comparable with other interventions and medications. Clinicians also appear to like rTMS because of its potential use in an office setting, without any need for anaesthesia or fear of serious adverse effects. Despite major advances in pharmacological treatments, depression remains one of the most widespread and debilitating forms of mental illness. It is characterised by a variety of symptoms (behavioural, affective, cognitive, and somatic) and a high risk of relapse and/or recurrence. The pharmaceutical categories include selective serotonin reuptake inhibitors (SSRIs), tricyclic anti-depressants, atypical anti-depressants, and monoamine oxidase inhibitors, and these form the bulk of the $15bn global spend in 2015 (which even with genericisation and pricing pressures is forecast to grow to $18bn by 2024). The major depressive disorder (MDD) segment was worth $3.2bn in 2015 (and is set to rise to $5.8bn by 2025). rTMS treatment is usually considered for patients with depression that has not responded to pharmacological anti-depressant medication. It is estimated that 15% to 40% of all MDD patients are refractory to any pharmacological therapy. Such treatment-resistant depression is acknowledged as a leading cause of disability (with high levels of morbidity and mortality) and the therapeutic strategies, including pharmacological augmentation strategies and brain stimulation techniques, reflect this. The FDA first approved rTMS in 2008 for the treatment of “patients with medication-refractory unipolar depression who have failed one good, but no more than one, pharmacological trial”. Treatment with rTMS usually comprises daily out-patient sessions lasting about 30 minutes, typically for 2 to 6 weeks. In depression, the activity of the left dorsolateral prefrontal cortex (DLPFC) is reduced. DLPFC is primarily associated with cognitive or executive functions, such as the maintenance and manipulation of working memory, intention formation, goal-directed action, abstract reasoning, attentional control and emotion. It is the reappraisal and suppression of negative affect that is believed to be a protective mechanism against depression, in other words depression is associated with abnormally low levels of left DLPFC activity. One of the real potential limitations of rTMS is the poor localisation of the target. This is typically based on a rather simplistic anatomical approach; namely 5cm anterior to the primary motor cortical representation of the hand (which corresponds anatomically to Brodmann areas 9 and 46). This “standard procedure” fails to take into consideration the inter-individual variations in brain morphology. Case studies have consistently shown that the variations in location can be quite significant; for instance, a well-cited patient study showed the prefrontal target was situated 8.3cm anterior to the hand motor cortex (a 3.3cm variation on an original 5cm measurement). Such variations in targeting underline the need for accurate navigation as part of each patient’s treatment protocol. The issue has been known for some time, with the correct stimulation area only being addressed in around 30% of patients. It is thought that the variable efficacy seen in many of the earlier depression trial analyses is due to this inconsistent approach to targeting, not simply between patients but also within individual patient’s treatment regimens. Yet despite such known limitations, the safety benefits and relative efficacy of rTMS has resulted in a good market reception among clinicians. As mentioned earlier, the FDA first approved Neuronetics’ Neurostar focal iron core coil TMS platform as a de novo device in 2008. In May 2018 Neuronetics announced that Neurostar had achieved the milestone of 1.7m treatments on 50,000 patients in the US, with 781 systems placed in 615 psychiatric treatment clinics, and it had posted revenues of $40.3m and losses of $16.1m in the year to March 2018. It also announced that it was filing for an IPO on NASDAQ. The plan is to raise $75m to $90m by offering around 5m shares at a range of $14 to $16, which suggests a market value of c $279m and an enterprise value of c $221m. The second FDA approval in 2013 was Brainsway’s H-Coil to deliver deep TMS for major depression. The submission used Neurostar as the predicate device, but it differs in targeting deeper into the cortex. This depth and breadth of stimulation is said to overcome the issues of precise localisation of the target area. Brainsway posted revenues of $11.1m and a loss of $7.1m in FY17. It listed on the Tel Aviv stock exchange in 2007 and has a market cap of around $60m. In 2015 the FDA similarly approved Magstim’s Horizon figure-of-eight coil rTMS system. Magstim majors on its platform being intuitive, simple to use and cost effective. Magstim is a UK private company that was acquired by Telegraph Hill Partners (a private equity group based In San Francisco) in 2015. Also in 2015 the FDA approved MagVenture’s MagVita platform. MagVenture is based in Denmark and sells its product range worldwide through distribution partners. The product range aims to provide a solution to most stimulation needs, with 7 different stimulators, 33 different coils, and a wide range of accessories. MagVenture is a sister company of Tonica Electronik, and both are privately held. Nexstim’s NBT was approved for depression in December 2017 also using Neurostar as the predicate device. The key difference to the prior devices is the accurate and reproducible navigation that underpins the platform. It was launched in May 2018 and the early indications are that clinicians readily appreciate the qualities that such navigation brings. To date, the rate of adoption for rTMS in depression has been low (as highlighted by Neuronetic’s experience over the past decade), but the body of clinical evidence that is building is increasing the momentum in clinical uptake. Cost effectiveness studies now support the introduction of rTMS treatment after a single failed antidepressant treatment round, with greater cost savings and better outcomes than the current practice of continuing successive medication rounds. It is credible health economic studies such as these that are encouraging payors to initiate rTMS treatment earlier in their adult depression treatment protocols. Nonetheless, when looking at the commercial potential for navigated rTMS it is worth making a brief comparison to ECT. Electroconvulsive therapy (ECT) has been available for 80 years and is still considered to be the most effective method of treating major depression. However, it is associated with notable side effects and continues to be the most stigmatized treatment available in psychiatry, a fact that undoubtedly hinders people from pursuing it. Clinically it is considered as a treatment of last resort and is used only for truly therapy-resistant patients. Despite this, about 100,000 patients receive ECT annually in the United States alone. Treatment consists of 6 to 12 sessions at a rate of 2 to 3 per week, requires a general anaesthetic and the patient cannot work or drive. The direct costs for ECT range between $10,000 to $20,000 per treatment. In comparison, with rTMS each treatment session lasts approximately 20 minutes and 3 to 5 sessions per week. A typical treatment protocol lasts 4 to 6 weeks. There no medical pre-treatment and after each session the patient can return to through their normal daily routine. The cost of an acute treatment course, using an existing CPT (Current Procedural Terminology), is in the $5,000–$12,000 range. Wider clinical adoption rests on improving the quality of the efficacy data and ensuring reproducible outcomes (which accurate navigation would enable). The addressable patient population in the US is c 4.8m. but even simply capturing the patients who would be considered for ECT results in a sizeable commercial opportunity. The simple fact is that virtually everybody will experience pain at some point. The pain management market was worth $36.1bn in 2017 and is expected to grow by 7.6% CAGR to $52.0bn by 2022. Prescription pharmaceuticals account for the majority of this, with narcotic analgesics and anti-migraine treatments holding a high value share due to their pricing. The market for devices is significantly smaller but is expected to grow by 13.4% CAGR to $8.6bn by 2022. This segment typically addresses chronic pain and includes a wide range of technologies such as neurostimulation devices, electrical stimulators, analgesic infusion pumps, radio-frequency ablation devices and others. Chronic pain, defined as lasting longer than three or six months according to geography, is common. The prevalence in Western markets is between 25% and 35%, with more than 100m in the US reported as experiencing chronic pain. Acute pain mainly serves a protective function, but chronic pain can be viewed as an ailment that severely impacts quality of life. Ideally treatment would involve the identification and removal of its cause, however this is frequently not possible and symptom management becomes the primary goal. The economic, social and individual burden of chronic pain is material and it is set to rise as a function of the ageing population and rising incidence of diabetes (mainly neuropathy). Between 40% and 50% of chronic pain sufferers fail to get adequate relief from pharmaceutical therapies (including narcotics). It is such dire clinical need that has seen the willingness of patients to experiment with any treatment and the rise of “alternative” and “complementary” therapies. Against this background the role for rTMS is attractive, yet there is little consensus about how to employ it. In part this could be due to continuing uncertainty as to the best target(s) within the brain, and how to influence them, but also it is due to large inter-patient variability. Unlike in depression, where the target area (DLPFC) is well defined and relatively constant, with chronic pain the degree and nature of neuroplastic remodelling can be extensive and exhibit marked variability. The unpredictability of the cortical remodelling suggests that accurate navigation would be key both in understanding the nature of the pain and then determining, and delivering, the optimal treatment. Nexstim’s NBT is CE Marked for the treatment of chronic neuropathic pain and is available throughout Europe. The FDA has yet to approve any rTMS device for chronic pain, largely reflecting the fact that no large, multi-centre, randomised clinical trials have yet been undertaken by any manufacturer. Nexstim undertook a Phase II study at The Walton Centre, Neuroscience Research Centre, Liverpool that evaluated 39 patients in a randomised, single-blind (patient), cross-over design. These had a median pain duration of 5 years and their responses were measured in a standardised pain diary. Treatment consisted of five sessions addressing two cortical targets for both active and sham groups. The results at one week post-treatment showed in the NBT arm 56% of patients reported a 15% or greater reduction in pain versus 11% in the sham arm (p<0.01) and at three weeks the results were 44% in the NBT arm and 4% in the sham arm (p<0.05). A follow-up study to examine the long-term pain relief is underway. Frost & Sullivan estimates that the neuro-modulation device market is currently worth $4bn and is expected to reach $6.2 billion in 2020 at a CAGR of 11.2%. Others, such as Research and Markets and Global Markets Insight, are forecasting similar growth rates (12.5% and 15.1% CAGR through to 2023 and 2024 respectively). This will be driven by greater penetration and adoption of existing technologies, as well as the introduction of novel procedures. The market is defined broadly as devices that use electrical or magnetic pulses to stimulate neurons and consequently modulate a body organ’s physiological activity. It is currently dominated by invasive (and minimally-invasive) technologies such as Deep Brain Stimulation (DBS), Spinal Cord Stimulation (SCS), Vagus Nerve Stimulation (VGS), and Sacral Nerve Stimulation (SNS). These are expected to continue to grow as longer-term cost-benefit analyses support their use; however, the bulk of the growth is forecast to be driven by the emergence of more non-invasive technologies and their translation into mainstream usage. Interestingly, chronic pain is currently the largest application segment in the neuromodulation market but, despite its lower incidence, the consensus is that depression is seen as the major opportunity for medium-term growth. Within the individual technologies, repetitive transcranial magnetic stimulation (rTMS) is expected to post the fastest growth, albeit from a small base ($0.2bn). ResearchnReports forecasts rTMS will achieve global sales of $497.8m by 2025, a 13.7% CAGR, with the US being the largest, and most receptive, market. Within Europe, Germany is the largest market (reflecting its strong research base in the field), followed by France, the UK, and Italy. The report views the growing appreciation of the value of accurate navigation as one of the key factors that will drive clinical uptake. The invasive device segment is typically addressed by large players such as Medtronic, Boston Scientific Corporation, Cyberonics, and St. Jude’s Medical; the non-invasive is still the domain of smaller, and more specialised, players such as Neuronetics (US) and Neocontrol (Germany). A number of the smaller players have, understandably, not progressed as rapidly as some had originally hoped due to factors such as funding and technology set-backs. Whilst the market overall is dominated by a handful of large global players, helped in no small part by their established reputations and sales networks, there is also a noticeable receptiveness to new ideas from smaller companies. Companies that have successfully demonstrated their products’ value have been able to carve out sizeable and lasting market positions. In common with most innovative healthcare companies the three main sensitivities relate to the clinical and regulatory aspects, the execution of the commercialisation plans, and the financial resources required to accomplish these. More specifically, the key near- and medium-term sensitivities include execution of the commercial strategy in the US and the rate of regulatory and sales progress. Addressing the important US market will require sizeable investments, notably in robust and compelling clinical trials to support registrations and to differentiate the proprietary nTMS platform from alternative treatments. It is the quality of the clinical outcomes and health economic data that underpin competitive differentiation, support attractive reimbursement, and help drive market adoption. The challenge is ensuring adequate investment in generating the data to sustain commercial momentum whilst balancing the near-term financial constraints. Assuming a successful outcome in the E-FIT study, the sensitivities shift to the successful execution of the commercialisation plans, specifically in the important US market. We believe changing existing diagnostic and treatment practices to enable adoption of Nexstim’s products is dependent on effective and motivated distribution partnerships coupled with compelling clinical outcome data. Europe has the same issues of acceptance and reimbursement, but these are made more complex by the underlying fragmentation due to differing national practices. Litigation is an ever-present threat and its impact is reduced by solid intellectual property (IP) and other barriers to entry. Nexstim currently has a total of 57 granted and 24 pending patents in 14 patent families. It also holds rights to the software for NBT and NBS, which have been developed in-house. The core algorithms have not been patented to avoid publicity and loss of trade secrets. They are also creating hurdles for competitors: e.g. by seeking patent protection on different parts of their platform and making it more difficult for potential competitors to create competing products. Funding does remain an issue. Nexstim operates in competitive markets where sustained investment in development and marketing is required to maintain the profile of the applications amongst its target audience. Development and commercialisation of innovative medical products is both time and cash intensive. Our forecasts suggest that Nexstim has a requirement of around €15m to achieve its near-term goals. The actual amounts and timings will depend on the rate of clinical acceptance and reimbursement on the one hand, and the investments in clinical data and marketing effort on the other. 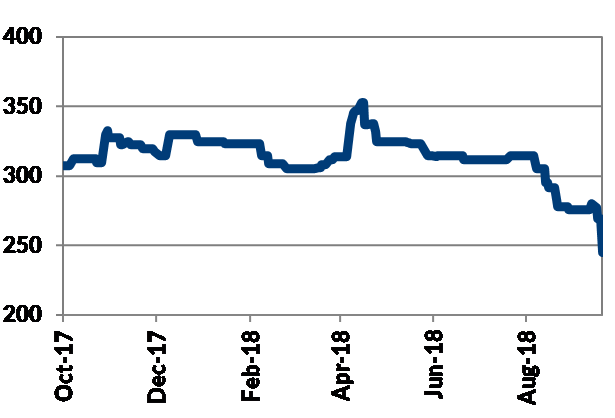 Other risks include exchange rate fluctuations, notably the US$ versus the €uro since the majority of Nexstim’s cost base is denominated in €uro but the bulk of sales should arise in the US. Additionally, we expect all players in these healthcare markets to face continuing pricing pressures as cost-containment measures remain a primary factor. We believe these factors can be mitigated by positive and meaningful clinical data that can support the cost effectiveness and value of new, premium priced applications. We consider a sum-of-the-parts DCF-based methodology (including risk-adjustments for the three key clinical indications) to be the most appropriate way to value Nexstim. We have employed conservative assumptions regarding patient populations, market sizes and growth rates, net pricing, adoption curves, and peak market penetration. Additionally, we have only valued the company’s visible assets with possible incremental clinical indications and off-label usage excluded. This results in a valuation of €120m, equivalent to €1.23 per share currently and €0.97 per fully diluted share. the earlier Phase II chronic pain indication. The risk adjustments range from a success probability of 100% for the brain mapping application to 25% for the early-stage pain indication. The largest element is the stroke indication and it is here that the success probability will swing once the E-FIT result in known. To illustrate the importance of the E-FIT trial result, raising the risk adjustment on the stroke indication from a success probability of 60% to 80% (assuming a positive outcome) would lift our valuation to €137m ($159m) or €1.09/share (fully diluted). Source: Trinity Delta; Note: Peak sales achieved after nine years in the US and 10 years in Europe. We assume the subscription prices for the 2018 options is the weighted average of existing options, which is €0.178. We use a 12.5% discount rate to reflect the fact that Nexstim is a small company operating in a competitive market; using a less conservative discount rate of 10% results in an increased valuation of €138m ($160m) or €1.09/share (fully diluted). We also highlight that, at present, our valuation only considers limited contributions from the depression and chronic pain indications. Evidence of commercial adoption in any sizeable market would represent valuation upside in our model. Within our model we have also accounted for the dilution from the outstanding warrants and options. We have also examined the worst-case scenario, where the stroke indication trial fails. Here we assume that the therapeutic indications have no value at all (despite the existing CE Marks for stroke rehabilitation, depression, and chronic pain, and FDA approval for depression). The revenue line now consists only of sales of the NBS diagnostic capital equipment and related consumables, but the operating profit line benefits from the cessation of clinical trial and other development expenditure. This, together with assumed aggressive cutting in central costs, results in a small sustainable profit being posted. The true market potential of NBS as a stand-alone product remains untested as management has rightly focused on the development of NBT rather than the marketing of NBS. As always, we employ only conservative assumptions, and so the NPV of this cash flow stream is modest, estimated at €13m, but, importantly, it is a positive value. In 2017 Nexstim posted sales of €2.65m, up 6.6% from €2.48m. This consisted of €1.72m from the sale of approximately 10 NBS units sold, and €0.93m from service and disposables revenues from the installed base of c 150 NBS systems (€6,200 per placed instrument). The reported gross profit was €2.09m, up 16.7% from €1.94m, with the underlying operating loss being €5.70m, down from the loss of €6.74m in 2016. The largest costs were salaries and development costs, mainly associated with the stroke clinical studies. The reported operating loss was €5.59m, down from €6.70m, but the increase in financial costs meant that the net loss was €7.33m, up from €6.73m. The sizeable increase in the number of shares from the conversion of convertible debt saw the loss per share being €0.09, from €0.56 in 2016. 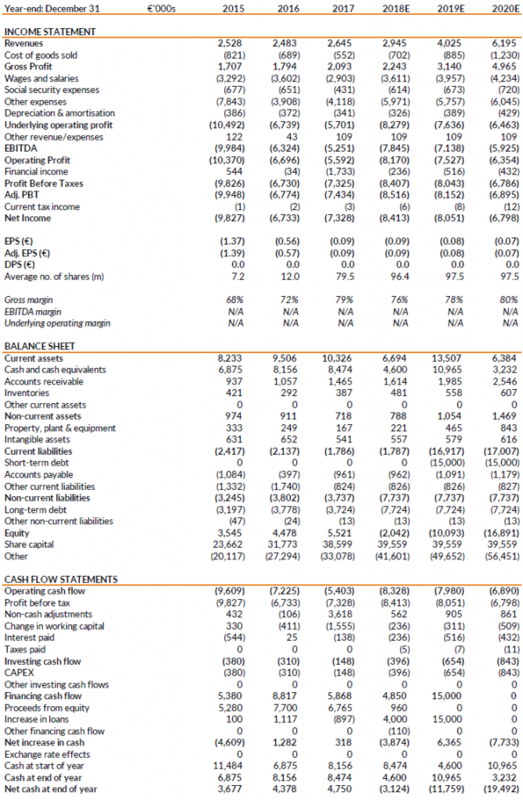 When analysing Nexstim accounts, it needs to be noted that the company reports under Finnish GAAP. Overall, the operating profit and net income would be similar if reported under IFRS or US GAAP; however, the gross margin is likely to be slightly higher under Finnish GAAP as all salary costs are included below the gross profit line. Looking ahead, we are forecasting sales of €2.9m in 2018, rising to €4.0m in 2019. It is worth highlighting that, in line with our prudent approach, our financial model does not include any contribution from indications that are yet to be approved. Conversely, and arguably it may be harsh, we do include the expected costs and expenditures (including preparations for commercialisation) in progressing these therapeutic indications. The bottom line is that we are forecasting net losses of €8.4m and €8.1m for 2018 and 2019 respectively. The stroke indication could be approved by the FDA in early/mid 2019, which would suggest that initial revenues could begin to flow through in late-2019. However, we believe the real impact of an approval would be felt in the 2020 results. Revenue from the sale of an NBS system is on average c €200,000, however there is some variability depending factors such as whether the sale was direct or via a distributor and movements in foreign exchange rates. Nexstim also receives on-going sales from its growing installed base of NBS systems, which include service contracts and disposables (e.g. head tracker devices). The average revenue that Nexstim expects to receive per annum from the placement of an NBT system is around €100,000. However, the sales models for NBT is more complex, as hospitals can pay a monthly fee (which includes the cost of all service and disposables products required), enter a pay per use contract, or buy the system as a capital purchase and pay per use at a reduced fee. We estimate that the company has sufficient cash to operate into H219 following the €0.96m equity raise in June 2018, and the decision to draw down the full €4m from the Kreos loan facility that was agreed in December 2017. The loan incurs an interest charge of 10.75% per annum and matures after 42 months; there are 1.74m warrants associated with the loan (which represent 1.78% of the issued capital) and they can be exercised within four years of June 2018. We currently estimate that the company will become cash generative from 2022, and that it will need to raise c €15m to achieve its near-term goals. It is worth noting that this extra capital could be generated from the exercise of all the outstanding warrants (see below). The amount that the company needs to raise will depend on the sales progress, and it might come from an equity raise or debt instrument, if insufficient capital is raised from the exercise of warrants. The company has a total of 97.5m shares currently outstanding following the €0.96m capital raise in June 2018, in which the Belgium-based Capricorn Health-tech Fund took a position. On top of this there are 33.5m warrants and 10.0m options outstanding as detailed in Exhibits 7 and 8. The warrants were issued to secure funding, primarily following the failure of the Phase III NICHE clinical study. There will be substantial dilution of current shareholders if all the warrants and options are exercised, but at the same time they could provide the necessary capital to allow the company to become profitable. Exhibits 7 and 8 detail the outstanding warrants and options that are in place. It is the maximum amounts of these that we have used in calculating the fully diluted valuations mentioned earlier in the Valuation section. Understanding the Effects of Repetitive Transcranial Magnetic Stimulation on Neuronal Circuits. Matheson et al. Front Neural Circuits 2016 Aug; 10:67. Martin Jamieson CEO and Chairman Chairman since December 2015 and CEO from April 2016. Previously CEO of Rayner Group, an ophthalmology company which developed the first intraocular lens, and Managing Director Smiths Medical International, part of the FTSE 100 Smiths Group. This followed numerous marketing roles in the pharmaceutical industry with Wyeth (Pfizer) and 3M. Non-Executive Directorships include Light Point Medical Ltd, and C-Major Ltd. Until December 2016 Senior Independent Director at Medway NHS Hospital Foundation Trust (UK).